TMW Arts, organized by the Estonian Contemporary Art Development Center (ECADC), will host a gallery evening called Tallinn Tuesday with a special programme and extended opening hours on April 3rd. Participating galleries are Gallery Positiiv, Okapi Gallery, EAA Gallery, Temnikova & Kasela Gallery and Vaal Gallery. The programme includes a variety of exhibitions introducing new projects by both Estonian and international artists and offers a great opportunity to learn more about the exhibitions, meet the gallerists and artists. In addition, there will be musical events at Gallery Positiiv and Okapi Gallery. Andres Teiss’ (EE) street photography exhibition “Being. Coming. Going” is on view at Gallery Positiiv. The artist, mainly know as a press photographer, describes his relationship to photography as follows: “Pictures from different moments of life have been following me my whole conscious life. Walking on the streets, I often see pictures around me, quite frequently I also think and talk in pictures and through pictures. Maybe it is my way to cope with the surrounding chaos”. During Tallinn Tuesday, there will be a sound installation by Taavi Tulev at the gallery. The joint exhibition by Anonymus Boh and Taje Tross shows large scale photographic panoramas from the series “Multiverse realities”. The works in the series are a combination of digital and silk screen printing, the works address the subcultures and communities that parallel the mainstream of our society, and the aims and behavioural patterns of which create a basis for completely new communities – fighters, amazons, women as future leaders, changed world order, rebirth on apocalyptic fields. During Tallinn Tuesday, there will be a live show at the gallery by Finnish alternative musician Risto Puurunen. Anna Slamova (CZ), active in Stockholm, and Marek Delong (CZ), based in Prague, have been collaborating since 2016. The works of the duo mainly address different emotional expressions and their acceptability in art. During Tallinn Tuesday, EAA gallerist Keiu Krikmann will introduce the exhibition. The exhibition “Any body suspended in space will remain in space until made aware of its situation” explores the language of cartoons in the context of contemporary art trends and trans-media identity policy. Since the 20th century futurists and dadaists, several generations of artists have used the comic book as a gesture of social critique and this also applies to the present moment. 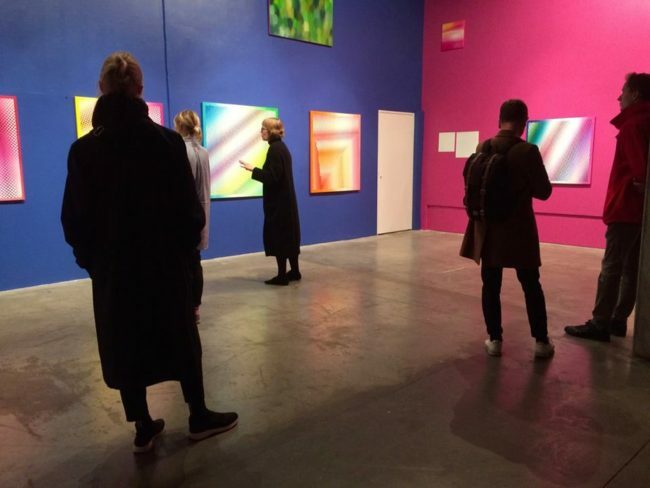 The exhibition is curated by Margot Samel, participating artists are Rhys Coren (GB), Jonathan Ehrenberg (US), Ella Kruglyanskaya (LV), Kris Lemsalu (EE), Priit Pärn (EE), Emily Mae Smith (US) ja Ken Tisa (US). During Tallinn Tuesday, Lilian Hiob from Temnikova & Kasela Gallery will introduce the exhibition. “Mercy” is painter Mauri Gross’ (EE) second solo exhibition at Vaal Gallery. The artist describes the exhibition and the title as follows: “The word mercy is so all-embracing that talking about it would take the force from it – the fig leaf falls from the loins and the remaining does not matter. Rather, the focus should be on fine-tuning, to support the inner monologue of the exhibition and to get a visual experience through minimalism and the overly narrative title”. During Tallinn Tuesday, the artist will be present and there will be a guided tour of the exhibition. Tallinn Tuesday gallery night is part of the 2018 Tallinn Music Week Arts program.